Our UT line of trailers is designed with extreme durability for years of trouble-free service. With two full-deck-length aluminum extrusions housing an adjustable tie down system, this trailer is ready to haul your ATV, UTV or combination. Take a look at some additional features below, and be sure to request a quote from your dealer when you find the model you’re looking for. 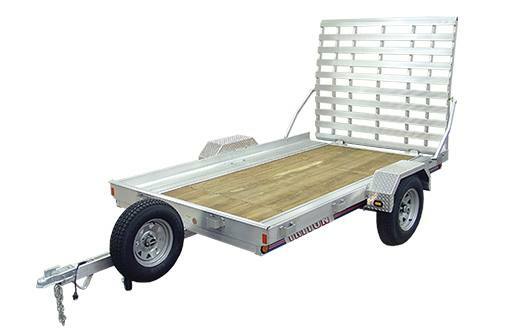 Combo deck has a plywood and aluminum extruded deck with integrated tie down system providing unlimited adjustability for safe and secure hauling. Aluminum diamond plate fenders for a stylish look and maximum durability. Fully treated marine grade plywood decking for durability and backed by a limited lifetime warranty. Stake pockets welded to the frame to build any size side railings or box that you require for your hauling needs. All hardware is stainless steel to resist corrosion. Tire Upgrade Options: ST175/80D13C ALUM.